Once, on a dare, I tried to bite into a piece of beef jerky that I found under the passenger’s seat of a friend’s car. We weren’t sure how long it was under there, but it was so tough I couldn’t even bite it. The game To Hell with Hell is tougher than that fossilized beef jerky, but a million times tastier. 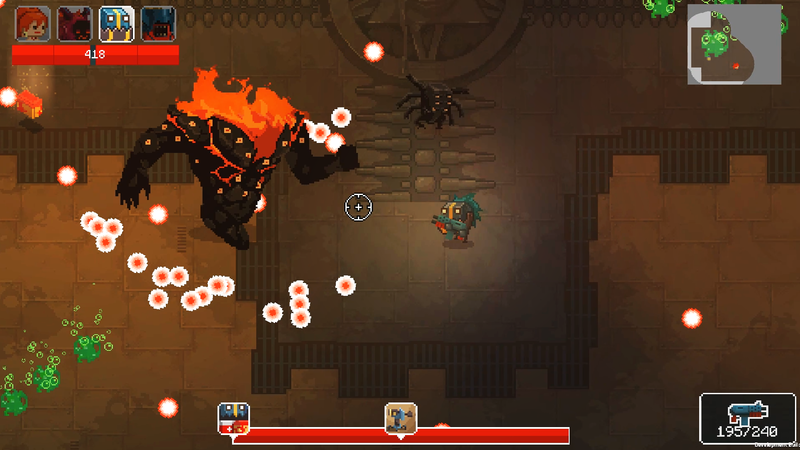 To Hell with Hell (THWH) is tough-as-nails (or fossilized jerky), rogue-like, procedurally generated, dual-stick, bullet-hell shooter currently in early access on Steam. That description looks like someone tried to make a game featuring as many popular steam tags as possible. However, THWH is so much more than that. I’ve spent a couple of weeks with the game and now come away very impressed. 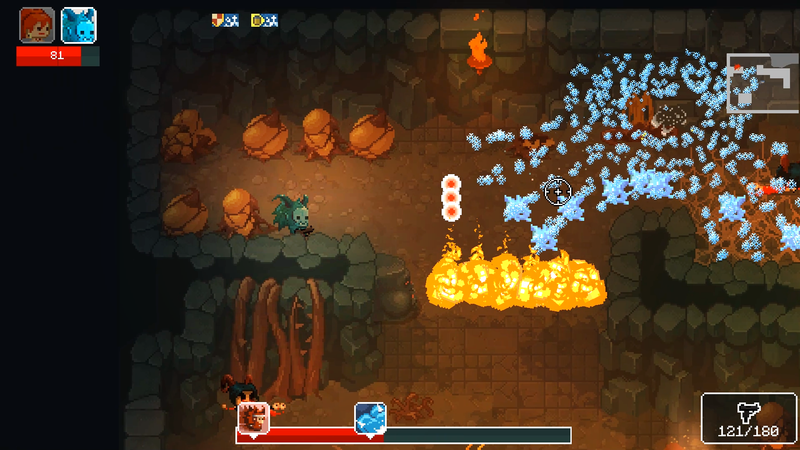 My first impression of the game was how similar it is to Nuclear Throne. While the base of the game is basically the same, there are a few additional features that make THWH different. The most notable difference is THWH’s mask system. In THWH, you play a bikini-clad half-devil character, but you can pick up masks that change you into other characters. Picking up a new mask gives your character a new appearance and abilities charged by the rage meter. You are able to carry two masks at the start of the game and switch between masks as you play. Each mask presents a different gameplay style with some emphasizing power others speed. Some masks even add effects to your ammo, while others will add a new weapon or even limit you to a specific weapon. The weapons in To Hell with Hell are varied and each one is fun to play with. You find everything from pistols and SMGs to butcher’s knives and crossbows. You can only carry a particular number of weapons at a time, so deciding between them can be very difficult. In between each level you can add perks to your character. These allow you to carry more weapons or masks at a time, regenerate health or ammo, or even permanently increase your stats. Developing a character that fits your play style using a combo of masks, perks, and ammo is very important. This is especially true because of the way that THWH handles saves. As I mentioned, this game is unapologetically tough. Part of the difficulty stems from the fact that the number of times you can save your game depends on your level of difficulty. On the easiest difficulty, you are allowed 6 total saves. In between levels you have to decide if you want to use one of your saves or try to keep one and push through. This adds some strategy to how you plan your push through the levels. The game randomly generates these levels towards the boss of each area. Speaking of the bosses, these are some of the toughest boss battles I’ve faced in a game like this. The boss battles never feel unfair, as there is always a clear pattern to allow you to develop your strategy. However, they will push you to your limits. I don’t know how many times it took me to clear the first boss I encountered, but it was more than a dozen. That was when I stopped counting. It didn’t really matter because I was having fun. I could tell with each try I was getting better and better. Really, for a game this hard, that’s about all you can ask for. 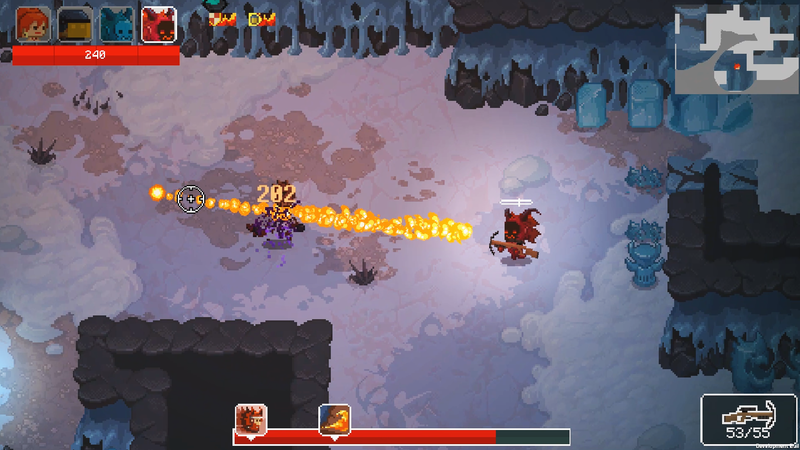 To Hell with Hell feels really polished for an early access game. Graphically and musically it is already looking and sounding great. There is probably some tweaking to the difficulty level the developers can do, but other than that, this is a really fun and addictive shooter. I fully recommend checking it out, early access on Steam is out now.